Horse and carriage. Fish and chips. Pepsi and Shirlie. Some things are just meant to go together. And one of those combinations is cheese and chutney, slathered together on a cracker or three. So this month I’m excited to say that one lucky cheesy cook will win a set of six chutneys from the Suffolk-based company The Naughty Sheep. The Naughty Sheep is a quality jam, marmalade and chutney artisan factory, based in Ipswich. Their chutneys include: cucumber relish, red onion marmalade, plum chutney, piccalilli, Suffolk chutney, and bramley apple and mint chutney. Which would pretty much cover all your snacking needs until Christmas. And to stand a chance of snaffling them, all you have to do is share a blog recipe under the theme ‘Cheeseonal and Seasonal’. May is a riot of seasonal foods. You can go for a hedgerow scrummage and find wild garlic, nettles, ground elder and elderflowers. Or, in the shops and markets, May sees the return of such gems as Jersey Royals, asparagus, spring lamb, samphire and watercress. (Unless, of course, you don’t live in the UK, in which case you could be plunging into winter with completely different foods!) Recipes can be sweet or savoury, snacks or meals, starters or puds, as long as they contain both cheese and one seasonal ingredient. Want to take part in May’s Cheese, Please! Recipe Blog Challenge? The usual rules apply which can be found here. 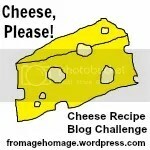 Write a recipe post under the theme ‘Cheeseonal and Seasonal’ and post it on your blog or website. To be eligible for the competition, recipes must be submitted by midnight on May 29th 2014. The winner will be announced on May 30th 2014. The winner must send their address details to me to pass on to The Naughty Sheep so that they can post your prize; we promise not to keep them or do anything sinister with them. Lovely challenge. Off to get my thinking hat on . . .
That’s a relief – no maggots required! Hmm winter produce….potatoes?? 🙂 Hopefully I’ll make it this month. I’ll double-check for you – I think the point is so they don’t have to post to the other size of the world so if it costs the same that seems a bit daft!